Well-known to locals and film art directors as Addison Plumbing, the property at 41 Wabash Avenue directly across the street from the Sorauren Fieldhouse and abutting Charles G. Williams Park is being redeveloped. The next meeting of the Sorauren Park Youth Leadership Advisory Board — SParkLAB — is Wednesday, February 20 at 7 pm, Sorauren Park Fieldhouse. 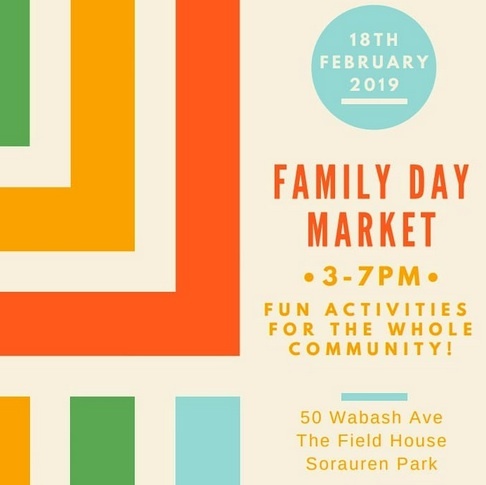 The Sorauren Farmers Market is always extra-special when it falls on a holiday Monday, and that’s the certainly the case this coming Family Day, February 18. Drop by the Market indoors at the Sorauren Fieldhouse for fun family activities in addition to shopping from great local farmers and vendors. The Market runs every Monday from 3 – 7 pm at the Fieldhouse, 50 Wabash Avenue. UPDATE: Come early at from 2 – 4 pm to enjoy the Family Day Skate at the Sorauren Rink, hosted by MPP Bhutila Karpoche. Free hot chocolate! Nobody kept score after the first half-dozen goals or so, but everybody was counting the smiles before, during and after the first-ever (first annual?) “Celebrity Shinny” match at the Sorauren Rink Feb. 2. The mighty red team from The West End Phoenix stared down the home-town Sorauren Hosers All-Stars sporting their blue tops. The all-ages game went two hours in perfect conditions (just before the thaw that has closed the rink until further notice). Staff and friends from publisher Dave Bidini’s local independent newspaper were fended off by Hosers including Arif Virani, MP Parkdale-High Park, and ringer Emily in goal. Volunteer Hosers who build and maintain the rink, led by Joël Campbell, chair of Friends of Sorauren Park, demonstrated the speediness, poise and puck-handling for which they are, uh, renowned. Officials kept trash talk to a minimum and there were no penalty minutes. Snacks by Scott Mifflin and main photography by Susan Peschken, thanks both! The two non-profits depend on community support to serve residents. Subscribe for home delivery of the monthly West End Phoenix, devoted to telling the stories of our diverse, compelling and quickly evolving west-end neighbourhoods including Roncy, Parkdale, Brockton, High Park and beyond. Friends of Sorauren Park relies on volunteers and supporters to promote the enjoyment and completion of Sorauren Park. The rink should open again as soon as the weather improves with a return to below-zero temperatures. Watch for updates on SoraurenPark social media. Game on! 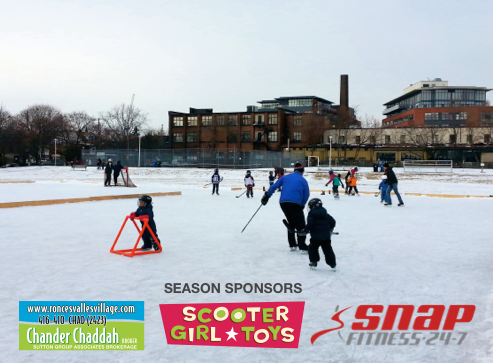 Cheer for your side in the First Annual Sorauren Park “Celebrity Shinny Match” this Saturday, February 2 starting at 1 pm. 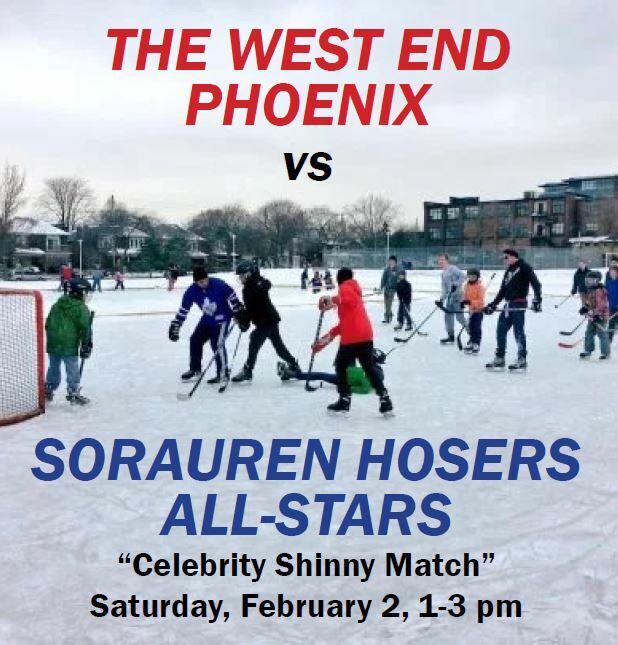 Two neighbourhood institutions will take on each other, as The West End Phoenix takes on the Sorauren Hosers All-Stars. The all-volunteer Hosers have done an incredible job this week, clearing up after the storm and fighting the polar vortex (and frozen hoses) to keep the rinks flooded. Drop by the info booth to learn what’s happening at the park and The West End Phoenix newspaper, and how you can get involved in park life and consultations for the new Wabash Community Centre. Pick up some cool WEP and Sorauren Park merch. Note there are two skating pads at the rink, so public skating will be available at all times during shinny. PS: Forecast calls for an almost tropical -2 deg C, just enough to keep the rink — but not spirits — frozen.